It was the extended weekend thanks to Eid and I was looking for a restaurant to dine at. Let me remind you that there is nothing better than a family dinner at a restaurant offering Indian food. I was pretty sure about going to The Walk, Jumeira Beach Residence and had heard a lot about Bombay By The Bay. So, Bombay By The Bay it was. As I entered the restaurant, I instantly fell in love with the interiors. 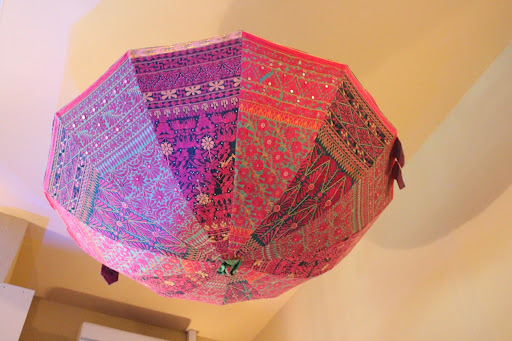 A lot of attention has been paid to the design and décor. 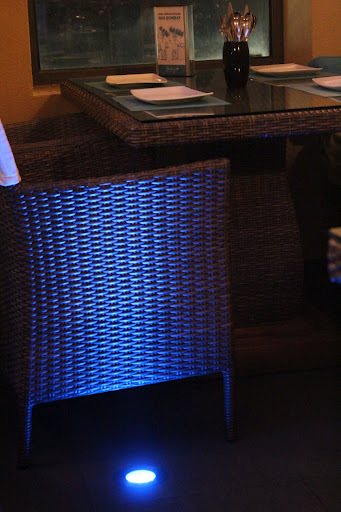 The lighting and the ambience make the dining experience special. I loved the blue lights that have been fixed in the flooring apart from the other lighting. 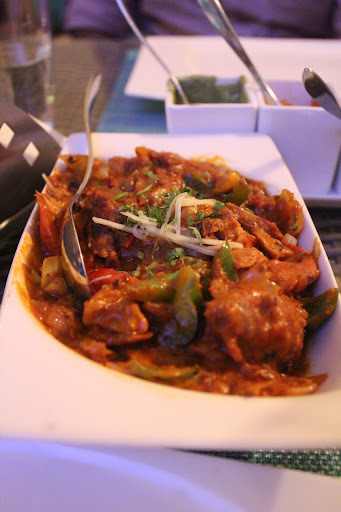 I have been to a plenty of Indian restaurants in Dubai and each one of them has a limited scope when it comes to non-veg. So when I sat down at the table with my family, the first thing was to run through the menu and check the variety the restaurant had to offer. To my surprise, they did have non vegetarian items that other Indian restaurants do not offer. It wasn’t in for much luck as my family refused to try prawns. 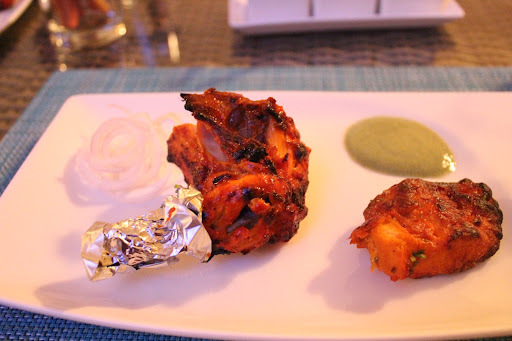 We settled for Tandoori Fish Tikka and Tandoori Chicken (Full) as starters. Even before the food arrived, there were two things that caught my attention. Firstly, there were no tissues on the table, a common mistake many restaurants make. We had to ask the waiter to bring us some. Secondly, the service is slow. It took around 20-25 minutes for the starters to arrive. By the time the starters arrived, everyone was pretty hungry. I just managed to capture a few shots of the food before everyone started digging in (the Tandoori Fish Tikka wasn’t that lucky though). 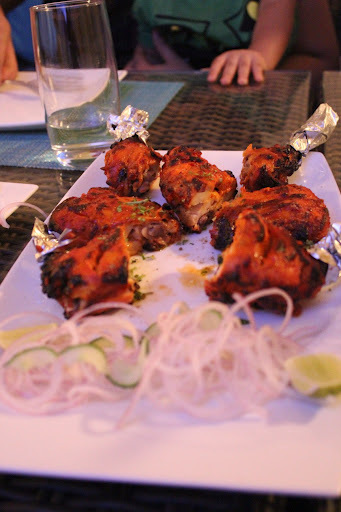 The Tandoori chicken was delicious. It had been cooked to perfection. Having the chicken with a mint chutney added to the taste. 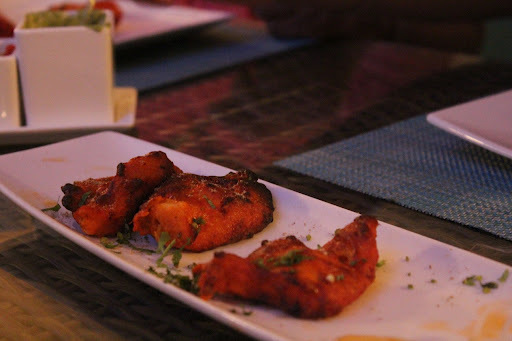 On the other hand, I felt that the Fish Tikka could have been better. Serving it with a different sauce would have helped. Since we knew that the main course would take time to arrive, we placed our order as the starters arrived. Dal Bukhara, Chicken Jalfrezi and Plain Naans made up our order for the main course. Our order also included a Green Salad. The Green Salad was not at all ‘Green’. The only thing green in the salad was Cucumber. The other items included Carrot and Onions. I am not a big fan of Salads nor am I that health conscious but it is funny how a basic salad is named as Green Salad. The vegetables were however fresh and I did not complain any further. Dal Bukhara was just about fine. I have had tastier versions of it. It was a bit on the spicy side. What saved me from the spices was the Aam (Mango) Papad that was present on the dining table. To be honest, the Aam Papad was good. Maybe not the best I have tasted, but good enough. Chicken Jalfrezi was pretty good. 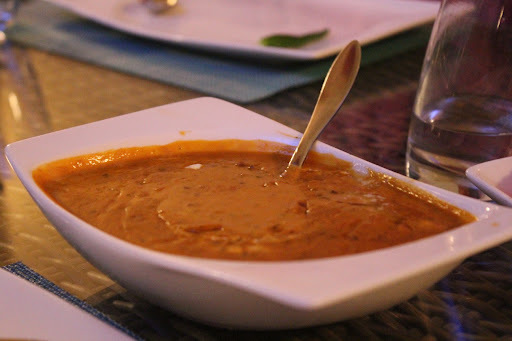 I liked the flavours and the mild spices. The vegetables in the dish added to the taste of it, making it yummier. It somehow gave me the feeling that the cook was excellent when it came to Chicken. The Plain Naans were soft and just about perfect. They went well with the food. Unfortunately I was too full to try the desserts. When I asked for the check, the waiter was kind enough to inform me that I would get a 20% discount on a RAK bank credit card. My overall experience was good. I liked a few dishes while the others were just about fine. However the ambience and interiors were the highlight. The service might be a bit slow but the waiters are helpful and friendly. I would recommend this restaurant to those who like Non-Vegetarian Indian food. Yes, it is. The prices have been revised. 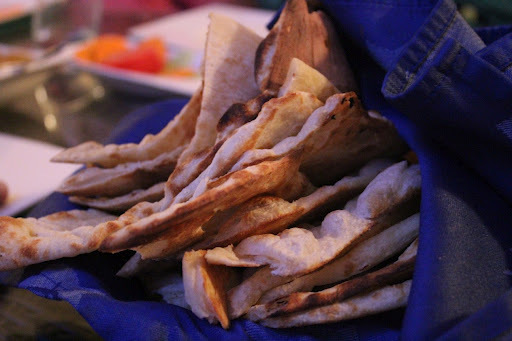 Its AED 10 in the recent menu for a Plain Naan while Garlic and Butter ones cost AED 12 each. Additionally, the green salad is AED 12 now. AED 14 for a piece of plain naan sounds pretty pricey! Firstly congrats on your new blog 🙂 A very good topic to start your blog with, a restaurant review. Something I usually like to read before going to a new place.You manged to cover everything in your post about this restaurant from the pros and cons to the seating and the decoration through thee photos and words :)The papad look actually 'different'. 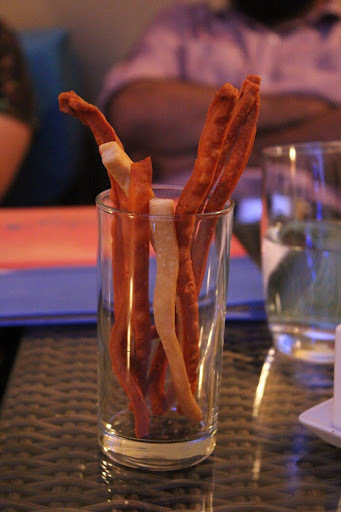 I had never heard of aam papad before reading your post. May go there just to have that ;)The mention about the tissues were a highlight of the post ;)It is a review one would definitely like reading before going to the place. Cheers !